Osaka International Airport and the surrounding area has been subjected to enormous damage on several occasions from flooding of terminal facilities and residential buildings around the airport in cloudbursts (in 1994, 1997 and 1999). This has been due to an increase in stormwater runoff, to the expansion of the runways and aprons at the airport, and to residential development in the Inagawa basin. The prefectural and national government constructed a temporary facility with the necessary drainage capacity (49mm an hour) to mitigate this flooding. When heavy rain causes the canal levels to rise to a point above the weirs installed, the runoff is drained into said facility and deters the water from flooding the airport terminals and local areas. 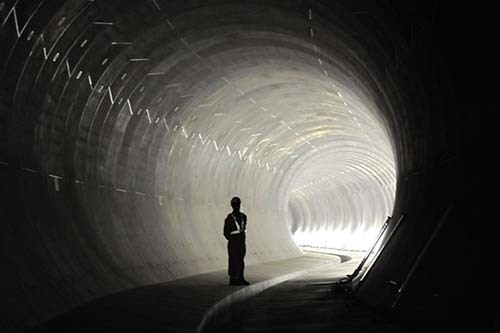 With an internal diameter of 5.8 meters and a total length of 1.8 kilometers, the tunnel can hold about 45,000 cubic meters of water. The water is retained until the water levels in the canal drop, and then the water is pumped back out. Kansai Airports has assumed control of the operation under a joint asset agreement with New Kansai International Airport Co., Ltd. and Osaka Prefectural government.